T'ween mystery party in a celebrity awards setting for 8-16 girls, ages 11 and up. 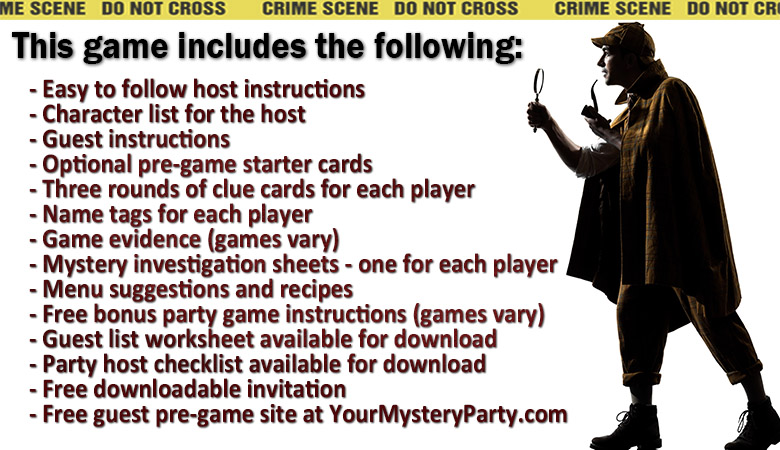 Non-murder mystery party in a celebrity awards banquet theme for 8-16 female guests, ages 11 to adult (albeit it is an easier sleuth than our other adult games, given the minimum age). This party may be hosted in a home. The case involves a stolen award trophy. There is an 8 player (6F, 2M) expansion pack available. This is the instant download upon purchase version of the game. There's nothing to be shipped, as you'll have everything you need with the download - no waiting, no shipping fees! Easy to host, easy to prepare. It’s time to experience the glitz and glam of Hollywood at the 100th Annual Oster Awards. This year, this uber-exclusive awards banquet will be held in the historical Beverly Hills mansion of the legendary icon - Merry Monroe. A-listers are set to arrive on the red carpet wearing the crème de la crème of designer fashion. This will be a night of caviar and glitter as the nominees wait with anticipation for the big reveal of this year’s Oster Awards! In addition to this awesome instantly downloadable teen mystery party game, there are optional bonus games included in the kit (these bonus games may differ from the party ready pack)If you wish to host this game for profit, you will need a commercial license - click here. Bullet list for host was extremely helpful! To echo what a previous reviewer said, the host should absolutely read through the entire instructional packet and use the bullet list/party timeline for each round and activity. This will help with game flow (you won't have to search through the big instructional packet during the game) and if you follow your party timeline it will ensure you don't go too fast or too slow through any round or activity. 12th Birthday Party - unique, different & fun! This was great fun for a group of 8 twelve year old girls. They really got into their characters for the entire evening. It did not take an excessive amount of work beforehand on my part, but I imagine it would require even less time if you bought the extra products instead of printing and cutting it all out yourself. The level of difficulty was just right for 12 year olds- only 3 of 8 guests solved the mystery but there was enough “evidence” that no one was just guessing whodunit. I purchased this for my daughters 10 year old's birthday party and it was a lot of fun. You could play this without purchasing anything besides the supplies to print out the sheets. Because it was her birthday I used higher end stationary and did a lot of decorating on theme, but even then (with dollar store decorations) this was a great value for the price. Some of the kids needed explanation about the structure of hollywood awards ceremonies (lead actress vs. supporting actress, etc. ), or the difference between evidence and motive, but that was to be expected since we were below the recommended age. It was not hard to overcome and didn't hinder their ability to play. I was worried the kids would lose interest; over three hours we ate appetizers, pizza, desert and played the game. The time went by quickly and I found I didn't need any of the bonus activities to keep it going, though we did take fingerprints for fun. I would recommend that the host put together a bullet list of the highlights of each round and the order in which you'll do them. It was especially important in round two where there are several steps and the order is important. All of the information is in the instructions, but you don't want to be re-reading in great detail while you are in the throws of the game.